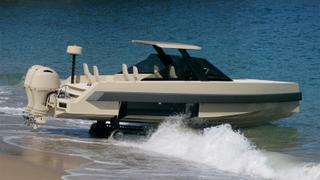 French yard Iguana Yachts has added a new model to its range of amphibious boats, the 9.2 metre Iguana Commuter. 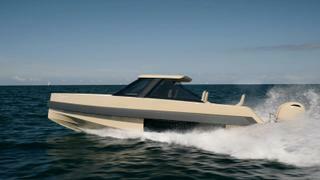 Despite the extra weight that these new features add, the Iguana Commuter is still a sporty performer — a top speed of 42 knots is possible on the open water thanks to a twin 200hp outboard engine set-up. 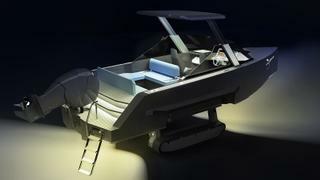 Six individual shock-absorbing seats make this a tempting option as a superyacht tender — in fact, Iguana adds that one of the first Limo models will be delivered to the owner of the forthcoming 69 metre Benetti custom yacht Spectre. On this version, the windscreen and roof will be completely removable for ease of tender garage storage. 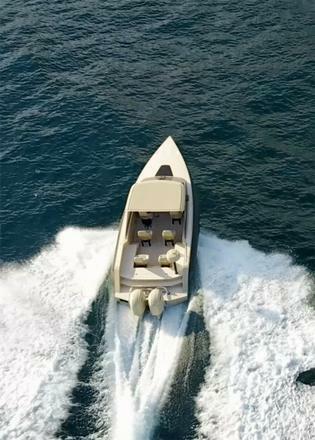 A more sociable Sport layout is also offered with a convertible C-shape wrap of seating amidships for those who want to use their Iguana Commuter as a dayboat. Other key features include an electric anchor with automatic depth measurement that is controlled via the touchscreen helm management system. 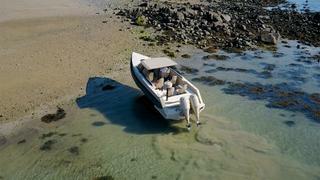 But of course the Iguana’s real party piece is the electronic amphibious drivetrain, which allows this transforming tender to drive up beaches and crawl over rocks at speeds of up to 4.3mph.